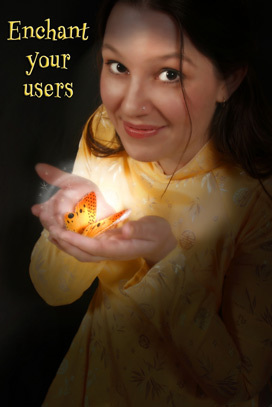 The best user experiences are enchanting. They help the user enter an alternate reality, whether it's the world of making music, writing, sharing photos, coding, or managing a project. Even a spreadsheet has the potential to be as engaging as a game. Until the interface comes crashing into your virtual world, throwing you back to the real one. That intense feeling of being engaged--the flow state--is interrupted. The spell is broken. Work or play comes to a grinding halt while you fiddle with controls, interact with the man behind the curtain, or--worst of all--refer to a manual. Every moment spent d***ing around with the interface, equipment, or bureaucracy is a moment spent outside the thing that interface, equipment, or system is meant to support. One of the themes I heard over and over at ETech and SXSW (Jason Fried, Craig Newmark, and others) was the developer mantra of "get out of the way." In other words, build the thing so that it stays the hell out of the way and lets the user get on with what they really want to do. Getting out of the way means not breaking the spell. 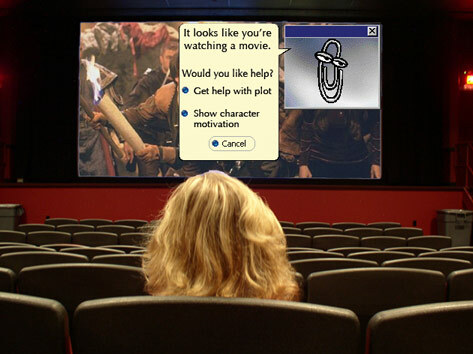 If your product is like a movie in a theater, ask yourself what parts of it force the user to be aware of the interface rather than the story? UI means User Interface, and UE means User Experience, but there's nothing in the UE label that suggests the experience is engaging. We tell our co-authors to always be thinking of ways to charm and enchant the reader/learner, so we're recasting the "E" in UE to "Enchantment." Sometimes...we even use the word seduce. Is this unethical and manipulative? Not if the user is a co-conspirator. 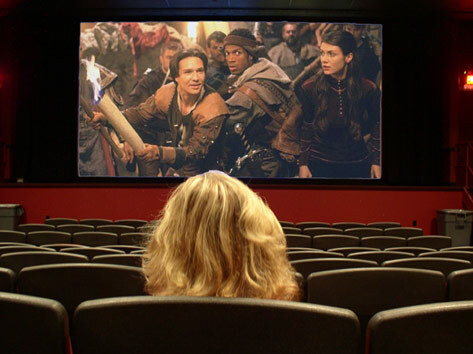 When I go to the theater, I want to be swept up in the world of the film. Anything that drags me back to the fact that I'm in a physical theater is an unwelcome interruption. We go into a theater ready to suspend disbelief, but as filmmakers know--if at any point the movie "breaks character", the spell is broken. Disbelief now puts the rest of the story at risk. Our readers pick up one of our books because they want to learn Java, Design Patterns, HTML, AJAX, etc. We know it, they know it, and we're not trying to trick them into something they haven't acknowledged they want. They are complicit in this "hero's journey." So no, we see enchantment and charm as a way to make the experience as engaging and flow-inducing as possible. Whatever your product or service, your users/members/guests are interacting with what you provide for a reason. And remember, that reason may be VERY different from, say, "using your tool." I don't use a camera to "use a camera". I use it to take photos. I want your tool (camera) to stay out of my way so that I can focus on the flow of composing and capturing shots, not working out how the hell to change the shutter speed. I don't use Basecamp to "use a project management app." I use it to manage my book review. I want the camera and the Basecamp app to fade into the background so I can focus on what I care about most. Most people claim that the times they spend truly in flow are among the happiest times of their life. I ended my SXSW session with, "As developers, we are so fortunate to have the opportunity to bring more joy into people's lives." But what about products and services that are used by different people to do different things? For example, some people use flickr for the photos, but others use it for the community. Should the photos get out of the way of the community or should the community get out of the way of the photos? And what if the product itself is the focus? People play games to play games, so how does the game get out of the way? I don't use FlickR so I'm guessing here, but the "get out of the way" approach means not being something that pulls you away from doing the thing you're there to do. The fact that there are multiple uses for FlickR would matter only if the different groups found the *other* use a distraction from their personal intended use. This is not that different from software products that manage to support different use-cases, but without helping one at the expense of another. If I had a product where two radically different use-cases evolved AND users insisted that their non-preferred use-case was getting in the way, then I'd break those two use-cases into two worlds. But again, only if it became a problem. I talked about this once before with Steve Krug, who wrote "Don't Make Me Think" and he agreed that you could extend that to, "Don't Make Me Think About The Wrong Thing." It should be challenging to play the game, but the interface should be as brainless (or at least non-intrusive) as possible. So for me, "get out of the way", means "get the stuff that interrupts this world (breaks the spell) out of the way so I can do what I really came here to do." Ha. "It looks like you're watching a movie." Great entry today, Kathy. Those answers are good enough to satisfy me. Thanks Kathy. As Alan Cooper would put it, "No matter how cool your interface is, less of it would be better." We can treat Microsoft Windows as a "bog standard" operating system. It works as well as anything we could have expected 30 years ago. So now we are free. We are free to develop whatever we want to. I am currently using Java. I am trying to work out how to use Windows API from java, and have almost given up - I cannot afford to buy books, and rely on the web, but there isn't much info there about using windows api in java. I want to use windows api to interact with other applications running on the computer by reading and writing to text areas.